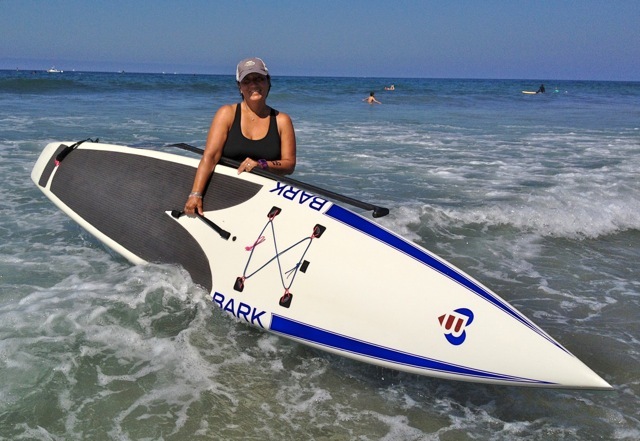 OCEANSIDE — Ruth Monahan-Smith will be among the celebrants at the second annual SUP (Stand Up Paddling) Chicks So-Cal fundraiser at 6 p.m. April 20 at the California Surf Museum. Smith is one of the core members of SUP Chicks and a breast cancer survivor.“I’m probably doing more for this event than I normally would, but I do it because friends are so supportive because they know someone who went through this,” she explained. SUP Chicks So-Cal founder Sabrina Suarez said the group got involved a year ago after first learning about Stand Up for the Cure, a Susan G. Komen affiliate dedicated to fighting breast cancer. “As a club we saw their event and thought, ‘Gee, charity work is what we do and we have members who are breast cancer survivors,’” she explained. Suarez and the other SUP Chicks quickly put together a fundraiser at the Encinitas Ranch Golf Course on April 28, 2012, that ultimately generated $10,000 in donations. The following week, on May 5, 2012, they were presented with a crown for generating the highest donations at the Standup for the Cure event in Newport Beach. Suarez predicts that this year’s event will be even more successful because of enthusiasm and a generous list of raffle and silent auction prizes that includes limited-edition, carbon-fiber SUP race boards; paddles; SUP board bags; board shorts; bikinis; a wakeboard excursion; ocean excursions and ocean art. Artist Wade Koniakowsky will donate a painting he’ll be working on during the fundraiser. In addition, author Roch Frey will donate a copy of his book “Riding Bumps: SUP Race and Prone Paddle Training,” which he’ll be signing at the event. There will be complimentary hors d’oeuvres and beverages for a donation. Each $125 donation will enable a local woman to get a mammogram through the Susan G. Komen organization. This could potentially save a life because the procedure can detect breast cancer at the earliest stage zero. One in eight women is touched by breast cancer and early detection is critical. Suarez says SUP Chicks So-Cal has 400 members, with about 20 percent being men. Saurez says anyone interested in joining can begin by renting a paddleboard from one of the local water sports shops for about $30 for two hours. Members routinely visit Facebook to see if any meet-ups are planned or forming. Suarez reports that most popular group meets at 9 a.m. Wednesdays by the Jolly Roger restaurant in Oceanside Harbor. Monahan-Smith, who celebrated her second year as a breast cancer survivor in February, said being out on the water was therapeutic during her treatment and recovery. “I was unable to paddle for six weeks after I had the mastectomy,” she said. “After each chemo treatment I would go out on the water and I started to slowly feel good.” She said she had to take a break following reconstructive surgery but eventually returned to the water. Standup for the Cure was awarded the Top Philanthropic Effort of the Year by SUP MAGAZINE. The California Surf Museum is located at 312 Pier View Way, Oceanside. For more information, visit contact: info@supchickssocal.com or visit supchicks.org or Facebook/SUP Chicks So-Cal.